Population: 3,250 as of 2000 Census, and 3,515 as of 2005 estimate. It is the largest incorporated town in the county, and probably all of the Northern Neck. In the summertime, the population swells to over 10,000. Beach: 2nd longest in the entire state! Stoplights: 1. It is located at the Beachgate. Back in the day, the stoplight used to be located further down at the intersection of Washington and Colonial Avenues. Weather Station: Located at about 38.25°N 76.96°W. Height approximately 9 feet (3 meters) above sea level. Radio Station: WGRQ is an Oldies/Classic Rock formatted broadcast radio station licensed to Colonial Beach, Virginia, facts sheet says. The frequency is 95.9 on your FM dial. Newspaper: The Journal Press has a Colonial Beach Edition and The Westmoreland News had an office next door to the Museum in town. Colonial Beach is a Golf Cart Town. It received this designation in 2004. 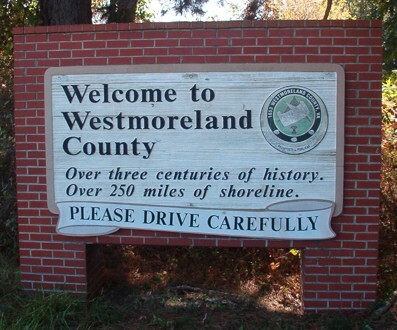 Here's one of my favorite Colonial Beach, Virginia Facts: Westmoreland County is one of just two counties in the entire United States to be the birthplace of TWO U.S. Presidents! They are George Washington and James Monroe. The other county to be the home of two U.S. Presidents' birthplaces is Charles City County in Virginia where William Henry Harrison and John Tyler were born. President Madison was born not far away, in nearby King George County at Belle Grove Plantation off Route 301. It is right near the bridge that takes you over the Rappahannock bridge into Port Royal.